Following the previous post about Beech Leaf Disease, I have continued collection of environmental data and begun acquisition of imagery from UAV drones to explore the continuing effects of BLD on the forest in the north woodlot of University Farm. The purpose of this post is to report preliminary observations about the lack of a discernable effect of BLD on the upper canopy of the forest and to update observations of BLD incidence in 2018. 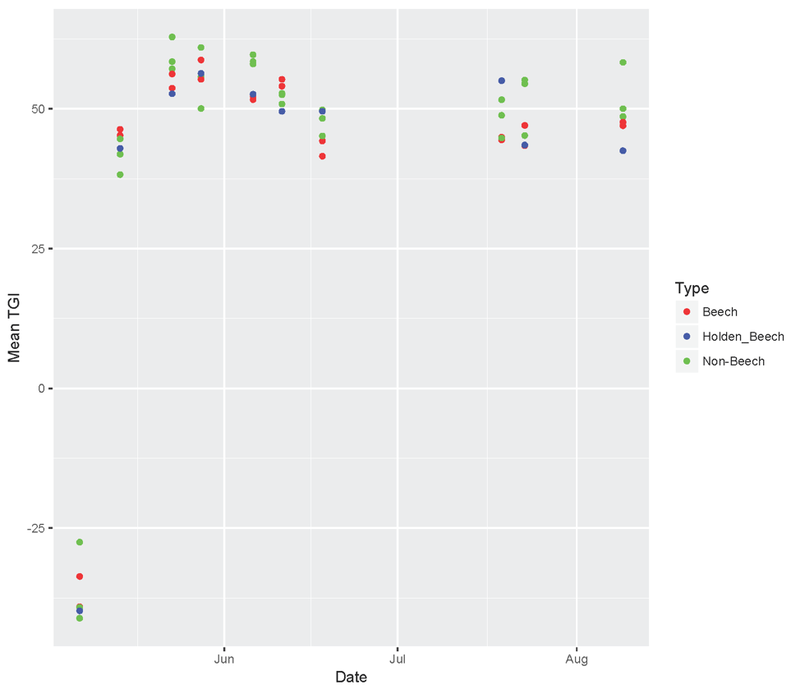 The BLD incidence in University Farm’s north woodlot in 2018 was similar to observations in 2017. Figure 1 illustrates the same diminished leaf growth in the secondary canopy of the north woodlot observed in 2017. Figure 2 is a close up view of the effect of BLD on beech leaves, showing the characteristic darkening of the area between leaf veins. Later the number of leaves showing the effects of BLD will increase and the leaves eventually shrivel and drop off. Figure 1. 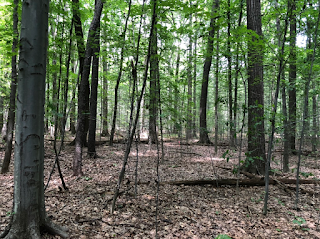 Openness of the secondary canopy in late June 2018 in a beech dominated area of the north woodlot of Case Western Reserve University’s University Farm. The photo is north facing in the vicinity of the north woodlot weather station. Figure 2. 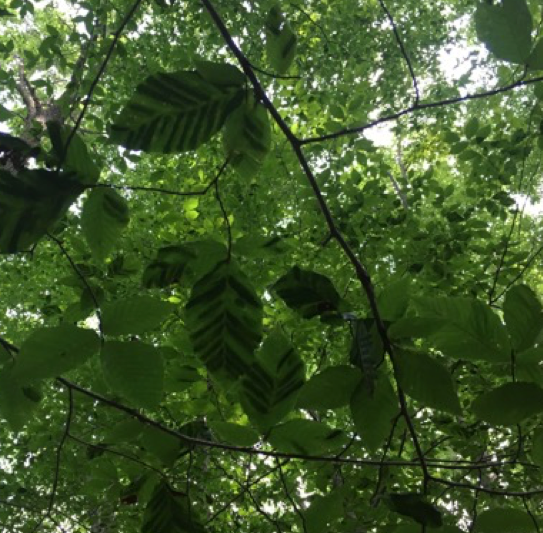 Close up view of infected beech leaves in the secondary canopy of the north woodlot of University Farm. 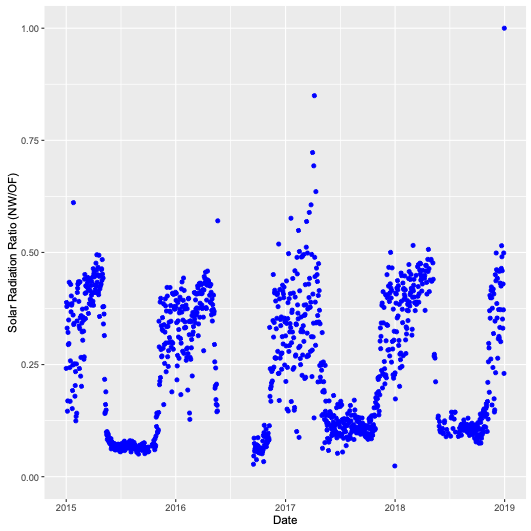 As in 2017, the light levels in the beech dominated area of the north woodlot increased relative to the levels prior to 2017. The ratio of forest incident solar radiation to open field solar radiation remained about double the levels in June to September of 2015 and 2016 (Figure 3). Figure 3. Ratio of forest to open field incident daily-averaged solar radiation observed at weather stations in University Farm. 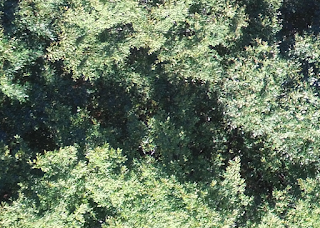 I monitored upper canopy foliage changes with two drone platforms. The DJI Phantom 3 Standard drone used in 2017 had a 12 megapixel camera with Red, Green, and Blue color bands. The DJI Inspire 2 drone used in 2018 carried either a 20 megapixel, Zenmuse X4s camera or a Sentera Double 4K Multispectral sensor. Both the Phantom 3 camera and the Zenmuse X4s take true color images using red, green, and blue color bands. The Sentera sensor has two cameras. One camera captures narrow red, green, and blue color bands, and the other has red edge and a near infrared color bands. University Farms’ Facebook page has links to two short videos (Link 1 and Link 2) about the use of the Inspire drone and its cameras. This post summarizes some of initial findings from examination of individual images. Future posts will more fully document collection, processing, and analysis of the imagery. 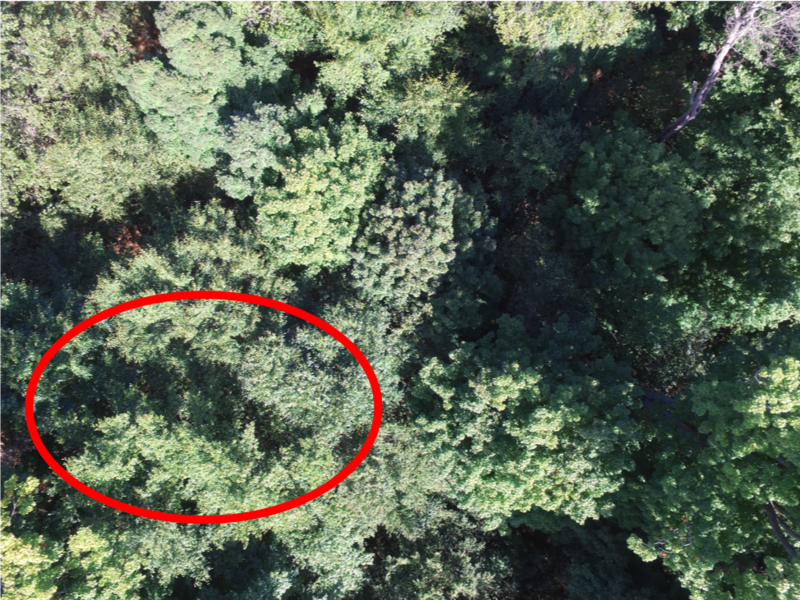 Drone mounted cameras and sensors provide detailed views of the canopy structure and leaf condition in the north woodlot. I first focus on the imagery of the upper canopy near the north woodlot weather station where the effects of BLD on the secondary canopy are most clear (see Figure 1). Figures 4 and 5 show a portion of the north woodlot with an area of leaf damage in the upper canopy of a beech tree (highlighted by a red outline). Damage in 2017 (Figure 4) seems less severe 15 months later (Figure 5). Figure 6 and 7 are enlarged views of the red outline areas in Figures 4 and 5. In Figure 6, the leaves appear sparse, under developed, and yellowed. BLD infected leaves in the secondary canopy, in contrast are thickened and darker than uninfected leaves. It thus seems unlikely that this type of damage is the result of BLD. Figure 4. Copy of a jpeg image from the DJI Phantom 3 Standard color camera on July 24, 2017 in the vicinity of the north woodlot weather station. The photo was taken at 45 m altitude. The area outline in red shows evidence of leaf damage in the upper canopy. Figure 5. Photo taken on September 17, 2018 at the same location as in Figure 4, in the vicinity of the north woodlot weather station. Image taken with a DJI Phantom 3 standard camera at an altitude of 45 m. Area highlighted with a red outline is the same as the area outline in Figure 4. Figure 6. Closer look at canopy damage in the red outline area of Figure 4 from July 24, 2017. Damage is to part of the canopy of a beech tree showing diminished leaf grow. The affected leaves do not seem to show the characteristic thickening of BLD infected leaves. Figure 7. Close up of red outlined area in Figure 5 taken on September 14, 2018. 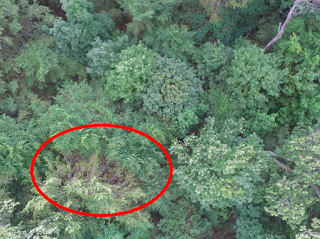 The close up is directly comparable to the image in Figure 6 and shows general recovery and possible loss of canopy structure a year after the damage viewed in Figure 5. 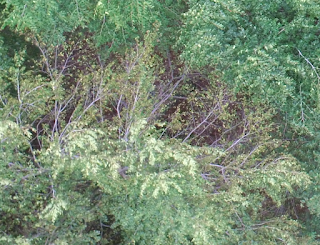 Although the drone imagery reveals some areas of upper canopy damage, determining the cause of the damage is difficult. Beech in the eastern portion of the north woodlot have been under stress for many years. The eastern part of the north woodlot is a remnant primary forest. More than 50 years ago, beech dominated this area, and finding beech trees with diameters (DBH) of more than 100 cm was common. Nearly all of those large beech have fallen out of the canopy. As in Figure 4, there are also many standing dead beech trees, and all of this mortality occurred before BLD appeared. Using an R script with the rgdal and gdalUtils libraries, I transformed each drone image into a GeoTiff raster for each vegetation index and sampled the mean value of the vegetation index from the raster values within a 1.5 m radius circle centered on a sample point in a set of specified sample locations. 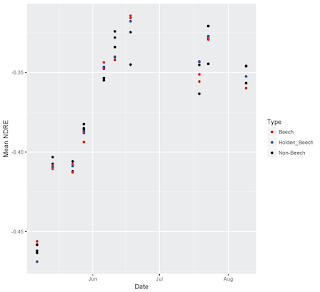 Creating a regularly distributed set of 200 sample points for the north woodlot provided a standard way to analyze both spatial and temporal variability of the indices. Figure 8 shows that the two indices are inversely correlated with a highly significant correlation coefficient of 0.64 and an RSQ value of 0.406. Figure 8. 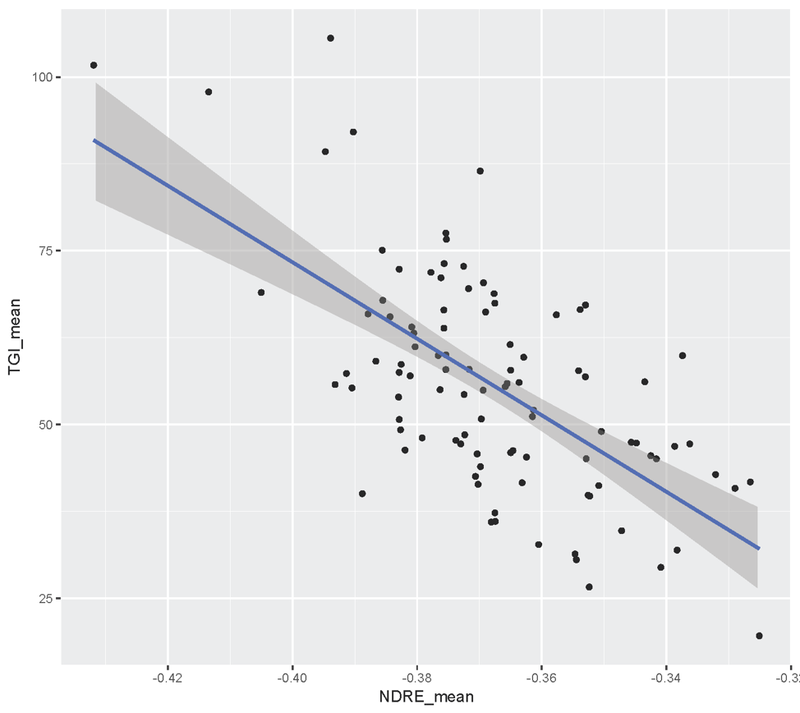 Scatter plot of the association of the mean NDRE and mean TGI vegetation indices for two hundred sample locations in the north woodlot. The correlation had an RSQ value of 0.41 and was significant at the 0.001 level. 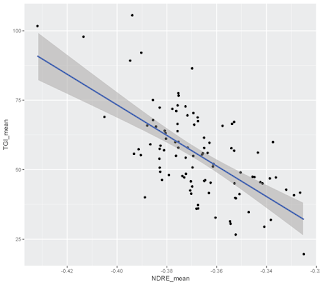 Also shown is the regression in blue and standard error band in grey. To facilitate comparisons of forest areas with and without beech, I created a set of spatial polygons. 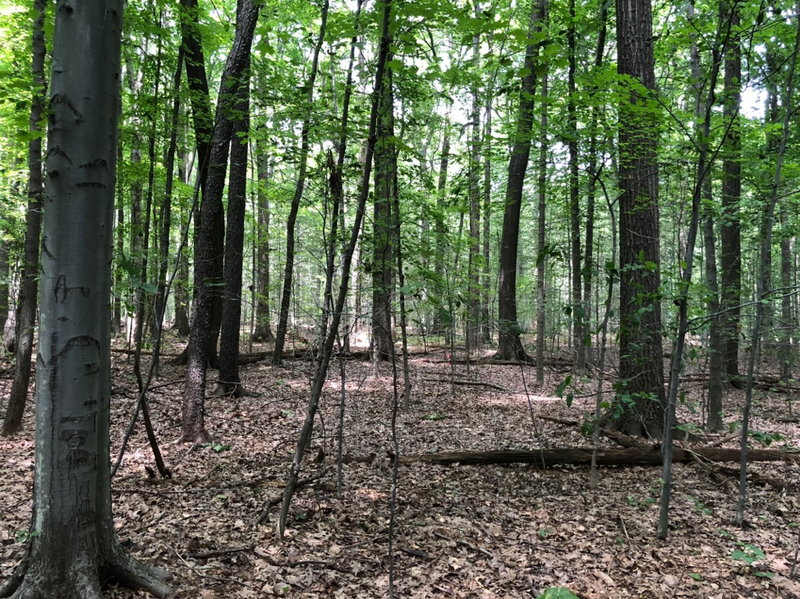 Three of the polygons were located in forest areas dominated by beech, including one area used by researchers from Holden Arboretum to study effects of adding fertilizer to forest plots. The other two areas were in oak and maple dominated areas. Each of the spatial polygons included a minimum of 4 of the 200 standard sampling points used for all pattern analysis. Figures 9 and 10 provide summaries of temporal variability of TGI and NDRE indices. I want to emphasize two aspects of the results. First, neither vegetation index shows consistent differences in order or values of the three types of sample areas. Second, the NDRE vegetation index seems more sensitive to changes in leaf irradiance after canopy closure. Figure 11 shows that full leaf out and canopy closure was complete by the third week of May when the TGI index reached maximum value. In contrast, NDRE values did not peak until the second week of June. Figure 9. 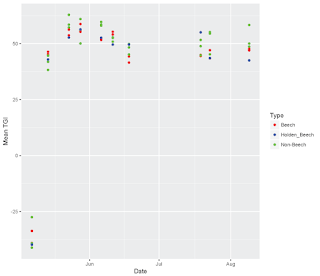 Temporal variability of mean TGI values in three types of areas of the north woodlot at University Farm. Results are for five spatially defined areas (2 Beech, 1 Beech plot used by Holden Arboretum for fertilizer application, and 2 non-beech). Figure 10. 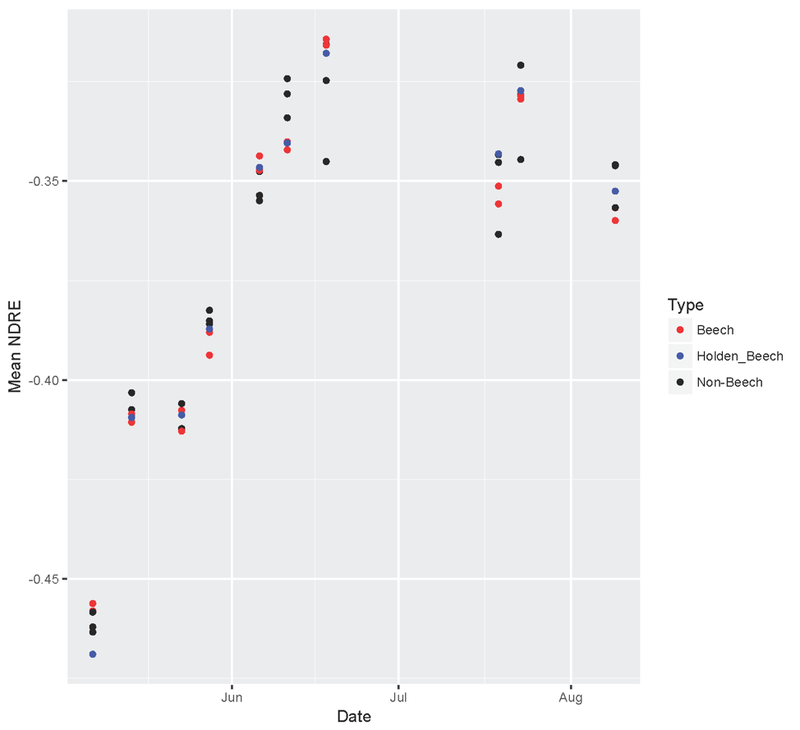 Temporal variability of mean NDRE values in three types of areas of the north woodlot at University Farm. Results are for five spatially defined areas (2 Beech, 1 Beech plot used by Holden Arboretum for fertilizer application, and 2 non-beech). Figure 11. Changes in ratio of north woodlot to open field incident solar radiation for the period May 1 to August 31, 2018. Despite the major effect of BLD on beech trees in the secondary canopy of the north woodlot and the increases in incident solar radiation relative the a 2010 to 2016 baseline, it appears that BLD has had much less effect on the upper canopy. Existing changes of upper canopy structure (damaged foliage or standing dead trees) seems a continuation of long-duration stress on beech. Leaf irradiance indices also show little evidence of a specific change in upper canopy beech leaf color or area that we would expect with the changes seen in secondary canopy beech (see Figure 2).